Have you ever played red light, green light? You wait with great anticipation to hear… Green light! With all the gusto you can muster, you run towards the leader. Yellow light! It’s time to slow down, it’s almost agonizing. Red light! You stop but your body hums with anticipation. When will you hear ‘Green light’? What if we were to obey God so eagerly? When God asks us to go we would drop all that our hands hold and run. When God would ask us to slow down, to listen for further instruction, we would strain our ears and listen intently. When God would ask us to be still, despite having other plans in mind, we would stop. We would obey the Leader and in each situation, we would follow the command. We have been given the greatest example. Jesus followed explicitly what God would have him do. He remained obedient to God in all circumstances, situations that included ridicule, betrayal, temptation, silence and ultimately death. Jesus would follow God’s commands that would lead to the cross. As God’s chosen people we are to obey God’s will, and frustratingly that does include times when we can’t anticipate the outcome. It is through our faith in God’s goodness and love that we trust God’s will. Our obedience is borne out of that faith, strengthened through that trust and is how we honor God. As we journey through Lent, we contemplate the cross and the implications it has on our lives. Let us consider this…be like a kid in your pursuit of the Prize, push all noise aside and focus solely on the voice that matters growing closer to God’s truth and love. Prayer: Lord, have your Holy Spirit fill us. Open our ears to hear your voice so that we may live in your will. Open our hearts to receive guidance. We are thankful for the precious gift of grace and salvation you have given us. May our obedience show our love to you. In your name we pray, Amen. When was a time in your life when you didn’t obey? How does your obedience reflect in your relationship with God? 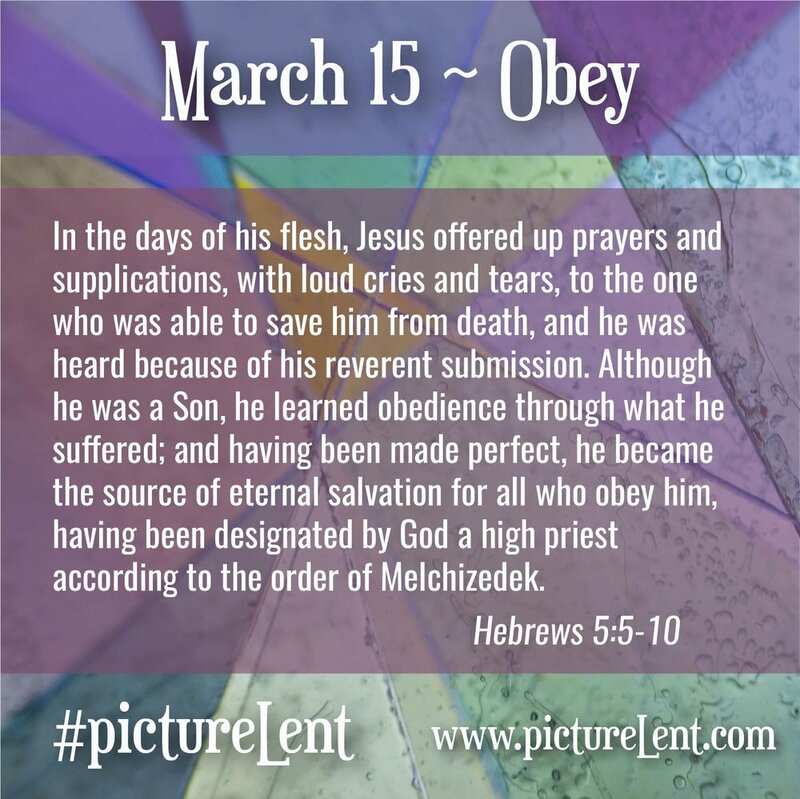 In what way can you be obedient to God today?